Article by BRITTANY BALLANTYNE, Valley Breeze Staff Writer. NORTH SMITHFIELD – Some people celebrate their 50th birthday with an ‘over the hill’ party, but John Beauregard of North Smithfield was looking to do more than blow out birthday candles. 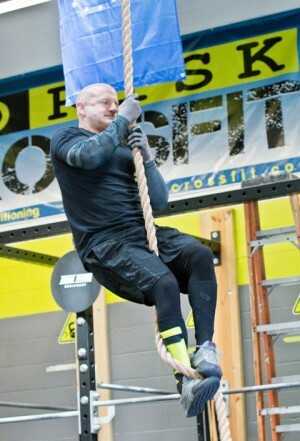 He chose to take on the challenge of climbing up a 20-foot rope 50 times at No Risk Crossfit in Smithfield, and raised more than $5,000 for Cops for Kids with Cancer in the process. Beauregard, a retired Rhode Island State Police lieutenant who turned 50 last Friday, has been doing Crossfit for the past five years and told The Breeze that it’s common for members to drop down in the gym on their birthday and do sit-ups, push-ups or burpees to match their age. The North Smithfield resident said after he told a few people about his idea to climb the rope 50 times, the word kept spreading – there was no backing out anymore. When interest in the gym grew, Beauregard saw it as an opportunity to start up a fundraiser for Cops for Kids with Cancer, an organization that helps families of children with the disease. As of last Friday, he raised more than $5,000 for the cause in just four weeks, surpassing his goal of $5,000. Previously, Beauregard said, he raised money for the organization while running in the Boston Marathon. He explained that he didn’t train specifically for the rope climb challenge, but continued to work out regularly at the gym. ‘I thought he was crazy,’ said his wife, Janice, who stopped by No Risk Crossfit with their daughter, Eden, 10, last Friday to cheer him on. Bob DeCarlo, manager of No Risk Crossfit, said he hopes other gyms in the area join in on Beauregard’s initiative to raise money for Cops for Kids with Cancer. DeCarlo said Beauregard ‘sets the bar high,’ and expects people to follow. As far as working out, DeCarlo said, Beauregard is always pushing himself to improve and push his limits, and his drive is contagious. ‘He makes everybody better in the gym by being here, and I think that speaks for itself,’ DeCarlo said.